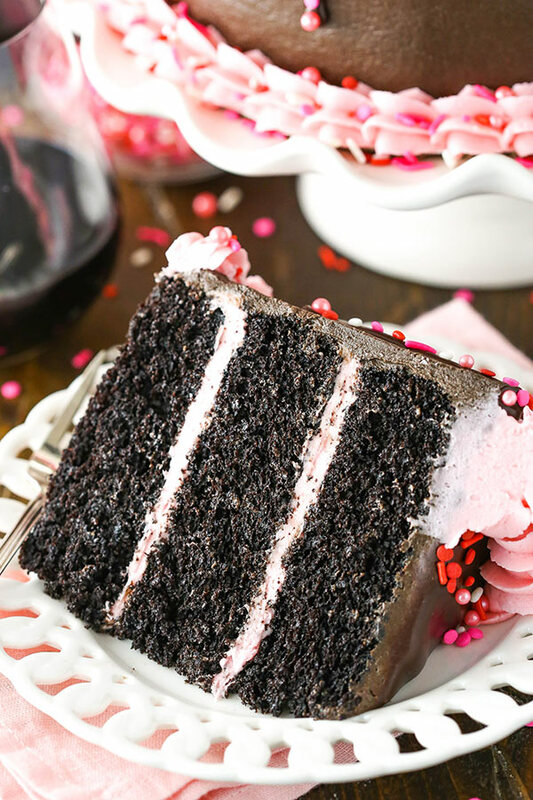 This Red Wine Chocolate Cake is super moist, baked with red wine and filled with a fresh raspberry buttercream! 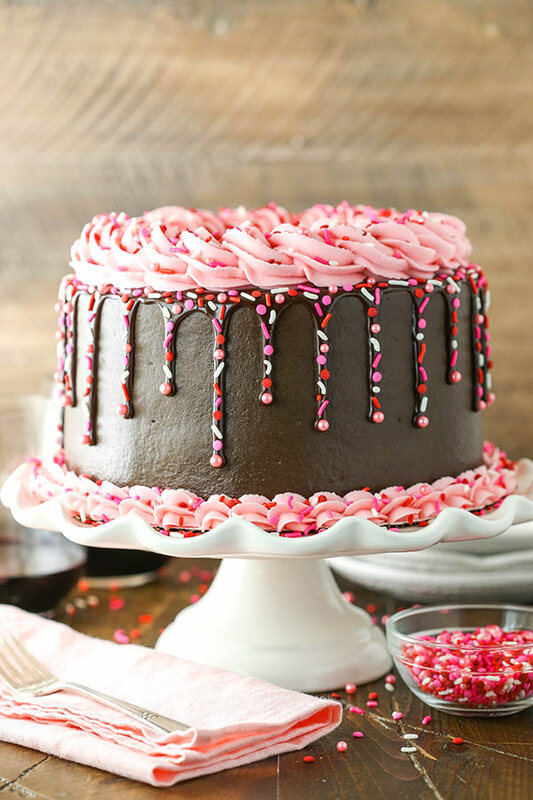 It’s decorated in such a fun way making it a great cake for Valentine’s Day or any occasion! Let’s talk a bit about the cake. I used my very favorite moist chocolate cake and replaced the water with red wine. It is the moistest cake and I die every time I have it. Now it’s even better with the addition of red wine. The flavor isn’t over powering, but it’s unmistakably there. I’m often asked if the temperature listed in the instructions is an error. It’s not. The chocolate cake is a slow bake cake that bakes at 300 degrees. I’ve tried to simplify it by baking at 350 but it changes the cake. Go slow, my friends. The wait is torture, but it’s worth it. The filling is a raspberry buttercream. 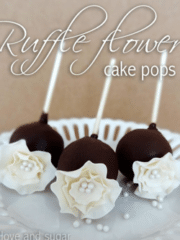 Super easy to make and literally the perfect compliment to the cake. The combination of the raspberry with the chocolate red wine will literally cause you to close your eyes and moan. Sorry, not sorry. It’s true. This cake had rave reviews from everyone! Even if you have no interest in decorating it like I did, you should absolutely make it. 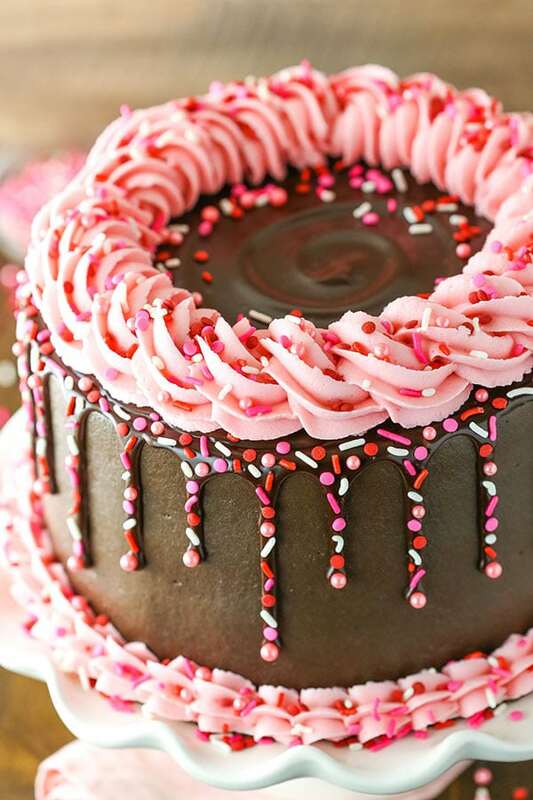 You could totally just frost it with the chocolate frosting and top it with some raspberries. You just need to make it – and eat it. Stat! If you are interested in the decorating part, let’s chat. 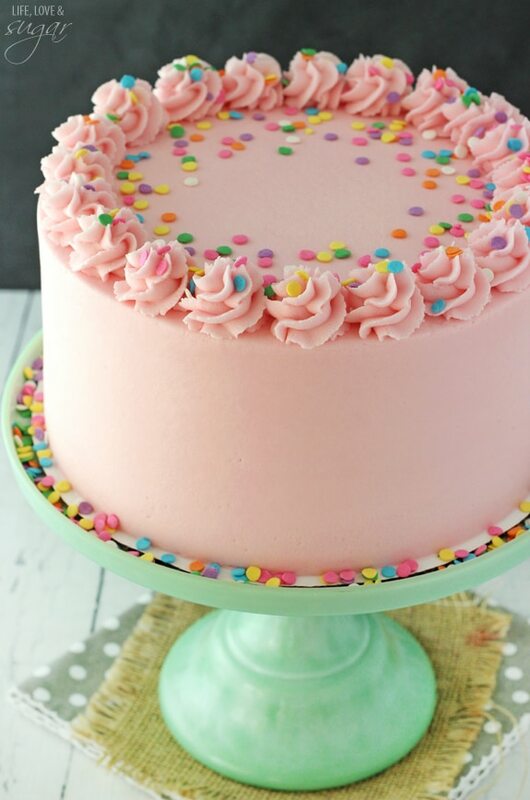 The decor of this cake is actually inspired by Brittany May Cakes. Her sprinkle cakes are just so fun, so I wanted to add a bit of that to this cake. To start, you’ll want to ice this bad boy like a champ. I can help you with that. I’ve got this great tutorial here on how to smoothly ice a cake with buttercream. 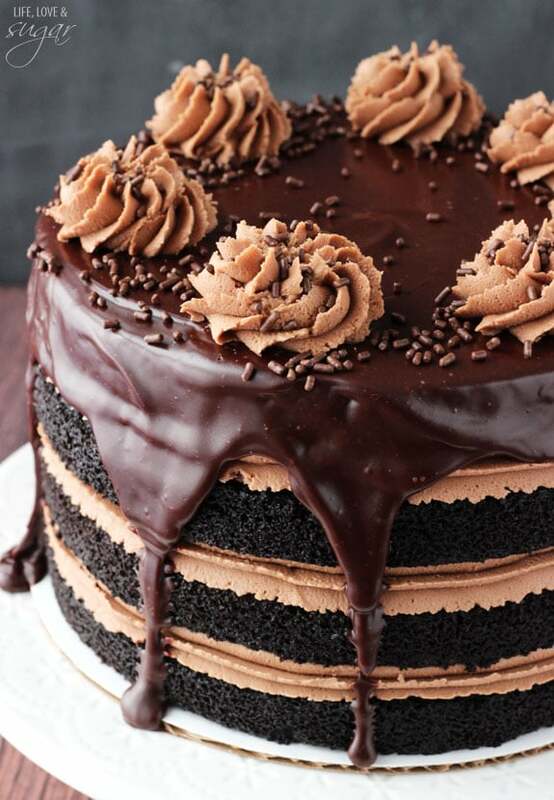 Once you’ve got your iced cake, it’s time to add your chocolate ganache drizzle! For starters, make the chocolate ganache. If you haven’t made ganache before, don’t be intimidated. It really is one of the easiest things to make. You basically heat heavy whipping cream, pour the cream over the chocolate to melt it, whisk it all together and you’ve got chocolate ganache. When your ganache is ready it will be fairly warm and thin. You want to let it sit for about 15-20 minutes, give or take, so that it has thickened a little but is still easily pourable. Pipe the ganache around the edge of the cake (I like to use a squeeze bottle for that), then work quickly (so that the ganache doesn’t get too cool) and pour the rest of the ganache on top of the cake and spread it evenly to the edges. You’ll want to let the ganache firm up a bit, then pipe a rope border around the outer edge. Brittany has a helpful video into her Insta Story highlights, if you want to see how to do it. The next step is to add the sprinkles. Lots and lots of sprinkles. 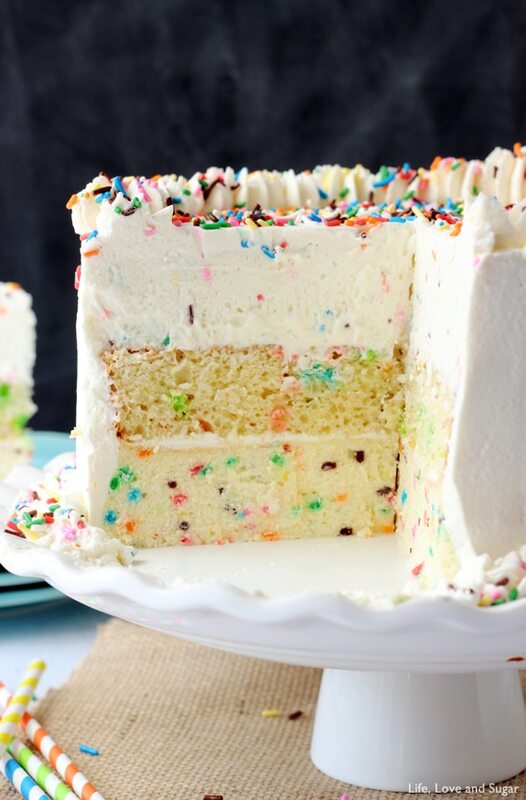 Adding the sprinkles isn’t hard, but it does take some time. To add them all to the drip, I used tweezers and it took a little over an hour. You can totally skip this step, but it creates such a fun look! When you’re done, you have a cake that not only tastes amazing, but looks amazing! 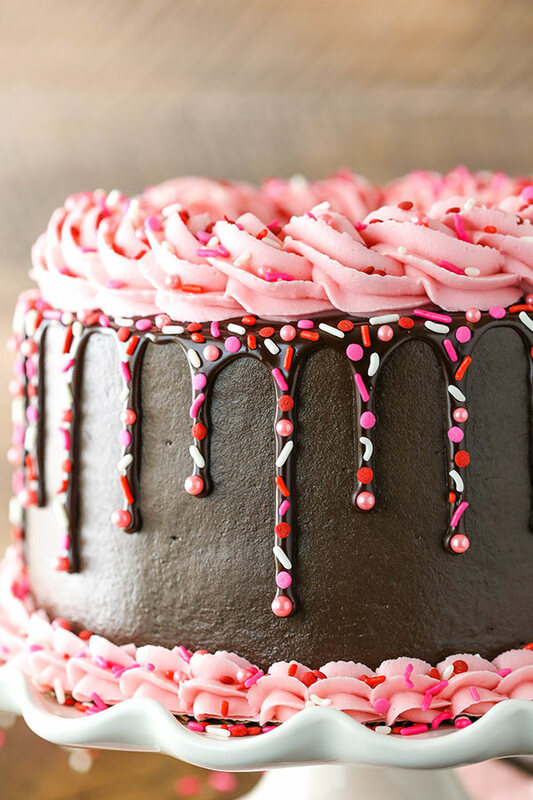 The chocolate cake is incredibly moist and tasty with the addition of red wine and the raspberry buttercream filling is the perfect compliment for it. And even more awesome is that the pink frosting on top is all color that’s added from the raspberries. There’s no food or icing color used at all. 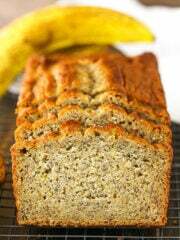 Simple, delicious – a must make! 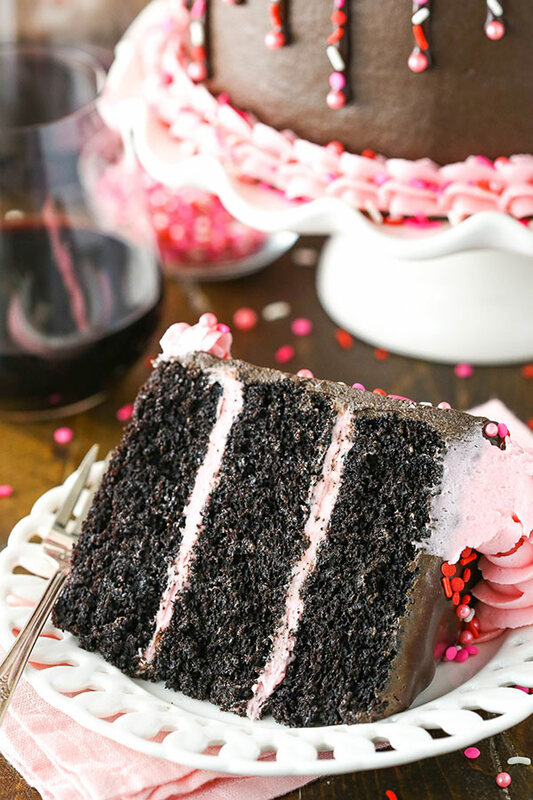 Moist red wine chocolate cake recipe filled with raspberry buttercream, frosted with chocolate frosting and covered in red wine chocolate ganache! 7. While cakes cool, make icings. To make the raspberry buttercream, add the raspberries to a food processor and puree until smooth, then strain through a fine mesh sieve to remove the seeds. In a large mixer bowl, beat the butter and shortening together until smooth. 8. Add half of powdered sugar and beat until smooth. 9. 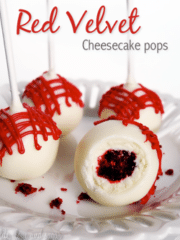 Add 3-4 tablespoons of raspberry puree and beat until smooth. 10. Add the remaining powdered sugar and beat until smooth, then add additional raspberry puree until it’s the right flavor and consistency. Set buttercream aside while you make the chocolate buttercream. 12. Add the cocoa and half of the powdered sugar and beat until smooth. 14. 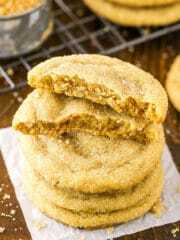 Add remaining powdered sugar and beat until smooth, adding remaining water or milk as needed to get the right consistency of frosting. 16. Place the first layer of cake on cake stand. Top with a cup of the raspberry buttercream and spread into an even layer. 17. Add second layer of cake and add another cup of raspberry buttercream and smooth into an even layer. 19. Frost the outside of the cake with the chocolate buttercream. Here’s a tutorial for getting a smooth finish. 21. Microwave heavy whipping cream just until it begins to boil. 22. Pour heated cream over the chocolate chips and let sit for 2-3 minutes, then whisk until smooth. Allow ganache to sit for 10-15 minutes to thicken. You want the ganache to be pourable and spreadable, but not too thin. 23. Drizzle the ganache around the top edge of the cake (I like to use a squeeze bottle), then pour the remaining ganache onto the top of the cake and spread it evenly to the edges. Allow ganache to firm up a bit. 24. Pipe the remaining raspberry frosting around the top of the cake and bottom edge. I used Ateco tip 847 for the top border and Ateco tip 844 for the bottom. 25. Add some sprinkles to the top of the cake and add them to the ganache drips using tweezers. For more information on decorations, read through the post. *the shortening can be replaced with butter, if preferred. Speechless. I just sent this link to about 17 people. Whoa. It’s amazing, Lindsay. Beyond. I want to make cakes that look like this! Thanks Mir! 🙂 And thanks for sharing it! You’re cakes are seriously the best I’ve seen. This one is beyond beautiful! 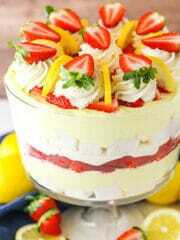 HELLO cake!!!! Another fabulous creation Lindsay! 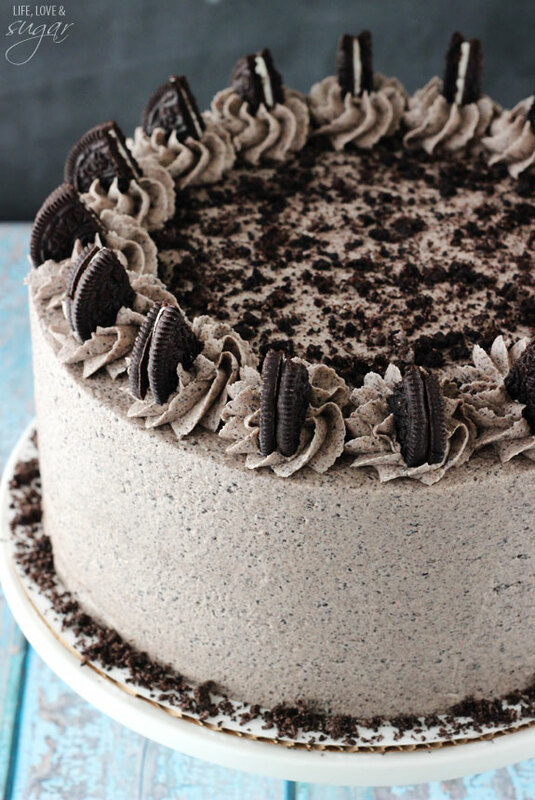 This cake is seriously an absolute masterpiece! Lindsay, what a great post. Thanks so much for the tutorial :-). I hope one day my cakes look as good as yours always do. 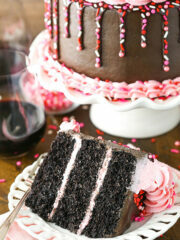 The red wine cake looks amazing, and definitely will be making that (no guarantees on the icing though haha. Pinned. Have a great day. I am fairly certain I can get Dell to eat this cake! Can you give an example of a sweet red wine you used? I can’t remember the specific brand, but I believe it was a red moscato. Uhhh, this cake looks unreal!! And it sound incredible!! I should try replacing the liquid in my chocolate cake with wine next time… How smart!! 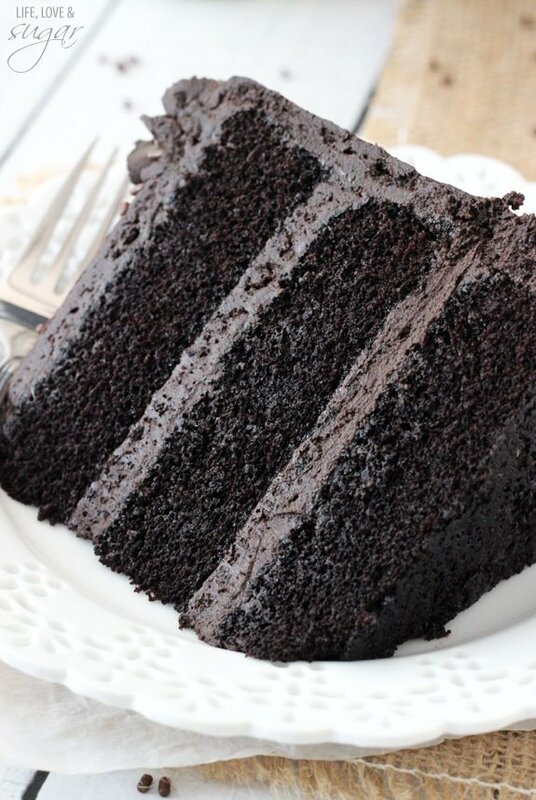 I love your chocolate cake, best ever and this cake is GORGEOUS! Do you think a chocolate wine would work in place of the sweet red wine? I haven’t heard of chocolate wine, but any wine should be fine. Cake & wine together?? Today is a goooood day! I am actually drooling over my keyboard right now…YUM!!! When I was a kid, this is the early 70’s now, my mom used to make this one cake… this cake I couldn’t find the recipe for. It was dark chocolate and very moist and definitely used powdered cocoa and this weird technique of pouring vinegar over a high-soda-content cake to create a tangy taste with a porous texture. Barring the strange moon-like surface, THIS red wine cake is VERY CLOSE to the one my mom made. I burned the first layer, so I ate it myself (from the bottom…to test if I could still use it for a trifle) and damn if it didn’t take me back. Thanks so much for the trip down memory lane! Hi there.. First of All i just wanted to say i really really loveeeeeeeee your page! 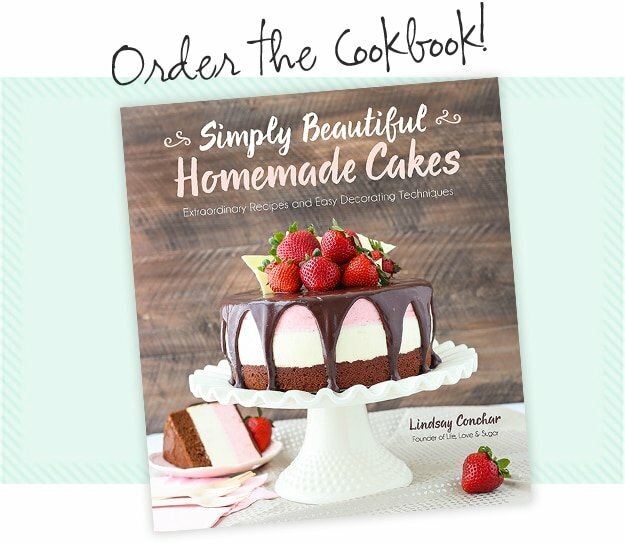 Love All The recipe…. I agree, the cake looks great, but has anyone actually tried it? 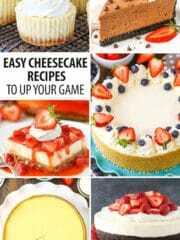 It would help to have actual reviews on the ease and taste of the cake.. Thank you Jillian! I appreciate the feedback. I think we all know that just because a cake looks good, doesn’t ensure its tastiness! I am going to give it a shot! Omg!!!! I made this cake – thank you very much!!! I have to make a cake for my cousin’s 50th birthday in 2 weeks and THIS IS THE ONE. Your directions were so easy and so thorough! My decorations weren’t as well done as yours but for a “practice” run, it came out great! The raspberries were a perfect foil for the sweetness of the buttercream and ganache. Excellent recipe Lindsey, thank you so much!! Does this cake do well as cupcakes? Yes, it does. I’ve made the cake as cupcakes many times. You’ll want to fill the cupcakes a little more than half way and bake for 18-22 minutes. Could you use frozen berries for the icing? That should be fine. I’d suggest thawing them and draining them first. 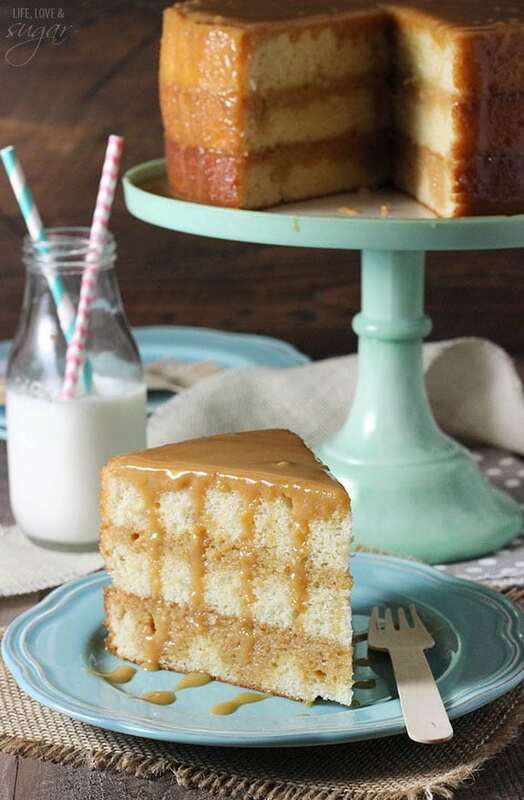 I can’t find the recipe for this cake? Help! You should be able to get it now. The site was temporarily down this morning for updates. 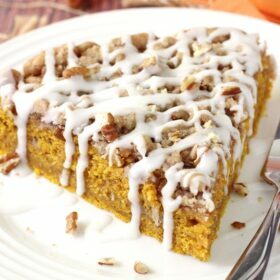 I modified the recipe to be Gluten Free and took this cake to a dinner party. EVERYONE, (including the gluten eaters) have declared this to be the cake no holiday or event can be without 🙂 Thank you!!!!!! I made this into cupcakes for my daughter’s birthday party (it was her request for the best cake ever!) I filled the cupcakes with the raspberry buttercream and topped it this the chocolate buttercream and drizzled the ganache. Amazing!!!! I don’t have 8 inch form, Can I use 6 inch or 10 ? i wanna make it for valentine’s day ? I just made this for Valentine’s Day/ my brother’s birthday, and everyone lost their minds. This is easily the best cake I’ve ever made. As soon as I get the tools you recommended for smoothing buttercream, I’ll try out another recipe too. You’re a baking wizard! Thank you! Awesome! 🙂 So glad everyone liked it! 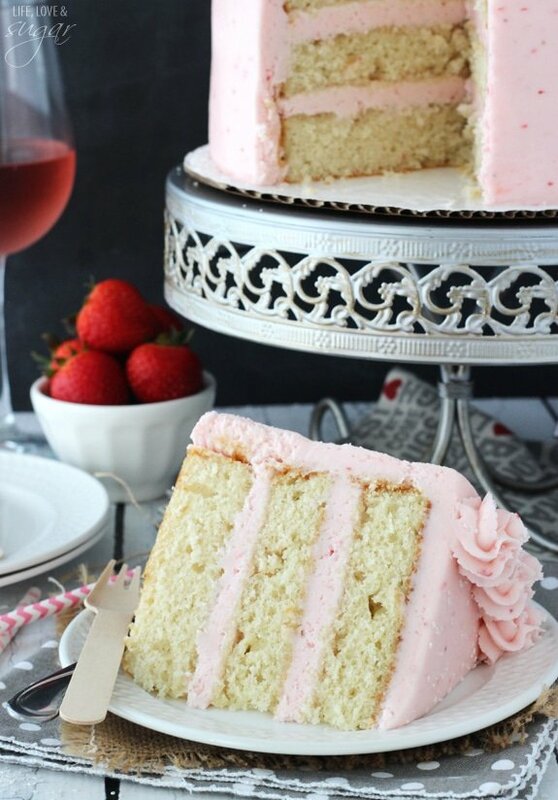 Can the cake be made without wine? Yes, it can. If you’d like to make this as a regular chocolate cake, you can find that recipe here. Should this cake be refrigerated? I am making for tomorrow and not sure if I should refrigerate. It would be best to refrigerate it with the ganache and fruit on it. Hi Lindsay! I made your cake for a friends baby shower. It was wonderful!! ???? I’m a chocolate lover and red wine lover so is there anything better?? Lol (I modified the recipe slightly by using butter instead of shortening in the buttercreams). I posted my cake here if you’re interested: http://fb.me/deniserayartworks along with your web link to give you credit! 🙂 Thanks! 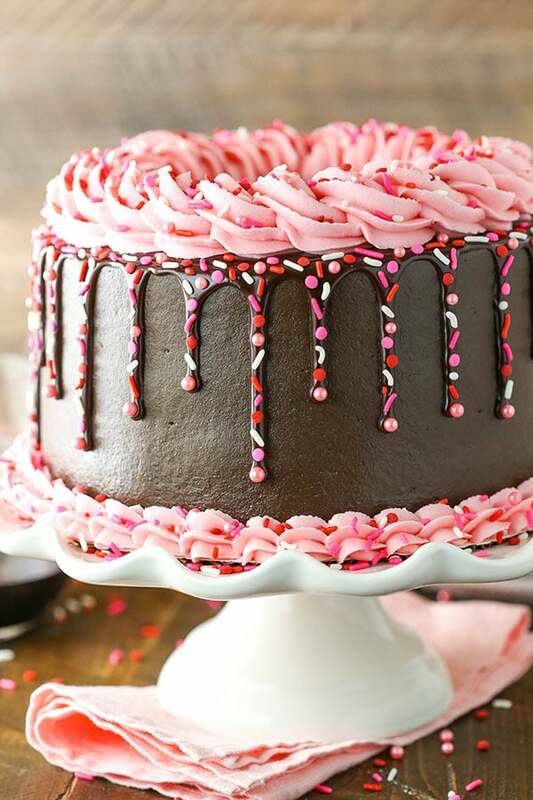 This cake is absolutely beautiful and I REALLY want to make it… but there’s just so much butter in the frosting… I can definitely do with the raspberry buttercream, but would you be able to recommend any frosting alternatives to the chocolate buttercream? Thanks so much for the recipe! Yum! Who doesn’t like red wine and chocolate together?!! Looks amazing! 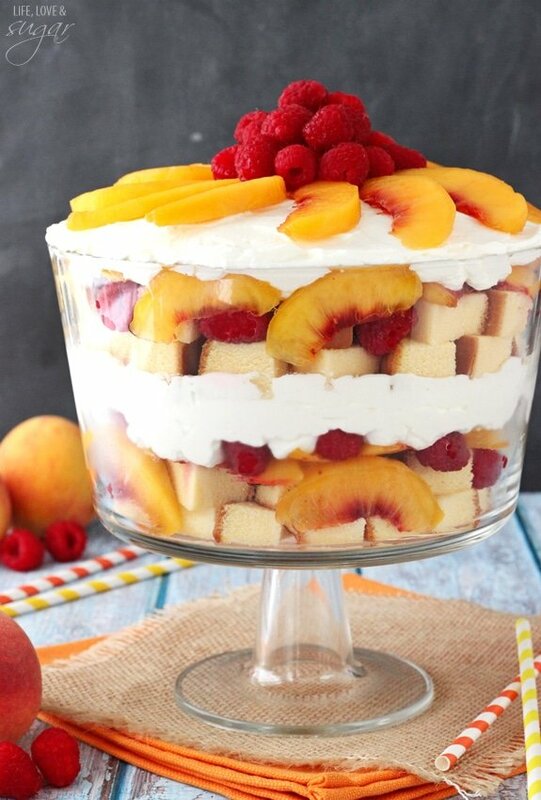 I’m making this tomorrow for a family gathering. I have a dumb question…do you think this is ok to serve to kids? Not sure if the wine in the cake would “bake out”, and the amount in the buttercream is small, and divided up is even smaller. Just seeking opinions. Thanks! Hmmm, that’s a judgement call for sure. I’d like to think the red wine bakes out, but I’ve actually read conflicting things about whether it does or not. Is the butter for the chocolate buttercream salted or unsalted? I noticed it specifies salted for the raspberry buttercream! I always use salted butter with the shortening, but if you are going to use all butter, I’d suggest unsalted. Do kids like this cake? And how do you think cherries or strawberries would taste? I’m not sure – we don’t have kids. I think cherries or strawberries would be great! Can the Red Wine cake recipe be doubled or need to be mixed separately? I am considering it for a bottom tier of a fancy birthday cake. I have made gobs of cakes…just not a red wine cake. I would really like to make this cake for a baby shower, however, I’m concerned about the red wine in the ganache. I think the alcohol is probably cooked out of the cake, but I don’t know if it would be in the ganache. Would this be safe for a pregnant person to consume? You can actually replace the red wine in the ganache with additional heavy cream, that way you don’t have to worry. 🙂 Enjoy it! I’ve made this a few times, my go to chocolate cake recipe now. Found a wine called jam jar, tastes amazing in it.. not a cake person but this just delicious..
Hi! 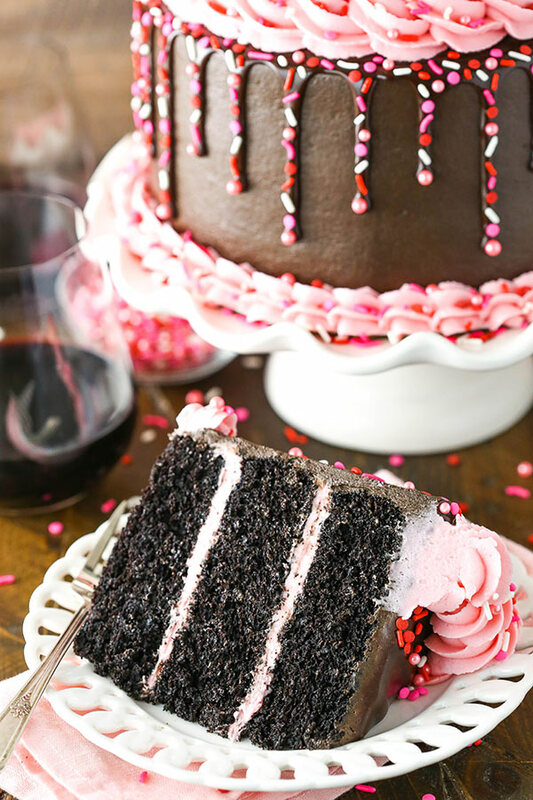 Your red wine chocolate cake looks really delicious. Can you recommend a specific brand of the best red wine to be used for your recipe. I would like something mild so that even the kids could eat the cake. Thank you. I like to use a sweet red, which should definitely be more mild. Barefoot has one that I’ve used several times and like. Thank you for your reply Lindsay. 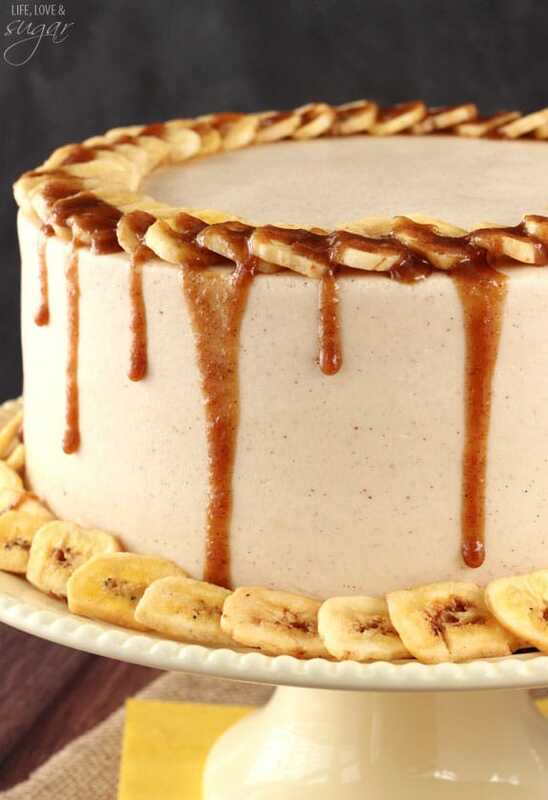 Hi!, Love this cake, i am going make this cake with 9 inch round Pan. I was just wondering how many cups of flour and other ingredients I would need? You’d use the same measurements, just cook the cakes for a little less time. You’re cake will also be a little less tall. Made the cake exactly per recipe for coworkers whom I try to impress with new creations. Never have they been so generous with the compliments; what a HUGE hit! I was afraid it would be too rich and chocolatey, but the raspberry buttercream and added fruit balances out the cake perfectly. I trimmed the bottom of the cake with blueberries and raspberries. The cake was so moist!!! Highly recommend viewing the tutorial, which was incredibly well written and helpful. I had no idea how to “properly” ice a cake and it worked like a charm. I even bought the recommended paper towels. What a wealth of information here done with care and love. I will definitely try other creations. Thank you, so much, for helping me spread good cheer and love to some amazing people through cake. What a beautiful way to touch others. I’d probably refrigerate it and take it out a couple hours before serving. Do you have blackberries available? Those would be good too. I tend to use a sweet wine, like Barefoot or something. I’ve made this cake at least 4 times. 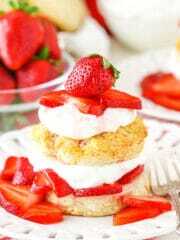 it is so elegant and absolutely delicious! The instructions were so easy to follow. Everybody raves about it after having it. It’s definitely a “remember that amazing chocolate cake you made?” kind of recipe. Made this cake for a work event; it was devoured with lots of moans and orgasmic eye-rolls. This cake was not difficult to make, just a few extra steps with the different filling, frosting, and ganache topping. I poured the ganache over the entire top of the cake and allowed it to drizzle down the sides, then decorated with fresh raspberries on the top and around the bottom. I added 1/2 teaspoon raspberry extract to the raspberry buttercream to kick up the raspberry flavor. Also, I had 2 cups of chocolate buttercream left after very thickly frosting the top and sides of the cake. I froze this for use later on cupcakes, but will half the recipe for the chocolate buttercream the next time I make this, and believe me THERE WILL BE A NEXT TIME!!! 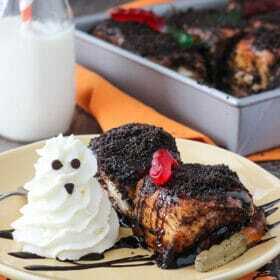 This cake is effin awesome!!! Wonderful! So glad it was enjoyed by all! This looks amazing. Would it be too soft to support a small tier on top of it? I’m new to tiers with cakes but I have read that only certain sponges can support tiers? Thank you in advance. I would think if the cakes are well dowelled and you aren’t resting a lot of weight on the cake, it’d be fine. 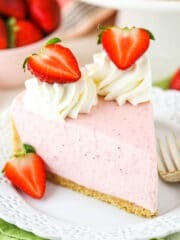 I’m planning on making this cake quick question ? Salted butter for the raspberry filling but the recipe says butter for the chocolate… unsalted? Sorry, I use salted for both when using half shortening and half butter. If you choose to use all butter though, I’d do half salted/half unsalted or just all unsalted and add some salt. I had to make a cake for a friend’s birthday. Since she’s a wine lover, I decided on this with a few changes. I made the cake and filling as instructed, then frosted with a Swiss meringue buttercream. I used a tiny bit of the wine in the frosting, too. I topped it with the ganache, then decorated with raspberries. It was a hit! I can’t say the wine was noticable, but the cake was delicious and looked stunning. Thanks for the recipe! Here in Costa Rica raspberry are hard to find… can i use blackberry instead in the buttercream? I haven’t tried it to know how it’d turn out. I HAVE to know where you got that cake stand!! Can you please let me know?? I got it from Home Goods. 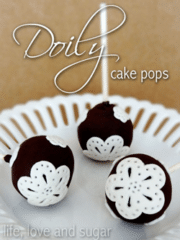 I am planning to make this and would like to bake it in 6″ cake pans. How long should I bake the batter for? I’m not really sure. I haven’t baked any 6 inch cakes. I’m sorry. I started to weigh out the dry ingredients for this and noticed that the weight doesn’t come close to matching the amount in cups listed. Do you weigh out your ingredients or follow the cup measurements? I want to make sure im following the recipe correctly. All cup and weight measurements are accurate (just double checked). There can be a lot of variation in how people measure with cups, so weight is always what I’d recommend to be sure of accuracy. That’s what I use. Last month I saved this link to make this cake for a dessert auction. Test cake went GREAT. Gorgeous. Delectable. Stood up well to being made a day ahead of time. Fresh raspberries on top the ganache were bliss. But… when I returned to the link to make it for the event, to my surprise the post had changed with a new decorated look. Both looks are stunning, but I was hoping to get the blog post instructions for the previous version (with the “hello” on top). Some ingredients also changed slightly. I made the previous version as best as I could remember (i definitely wanted that red wine in the ganache). The cake was a hit and went for a high bid — thank you! But for future, is that previous blog post still available online somewhere? Dang! I updated the recipe with new photos and decided to change up the decor. I wasn’t sure I’d be able to find the old stuff, but I did. I added it to a PDF for you to download and use. It’s just the ganache and decorating instructions, but you should be able to print the recipe PDF for everything else with the current recipe above. I hope that helps! And: thank you for your great blog & video on how you frost your cakes w/the piping, comb, and fondant smoother — that was GREAT.